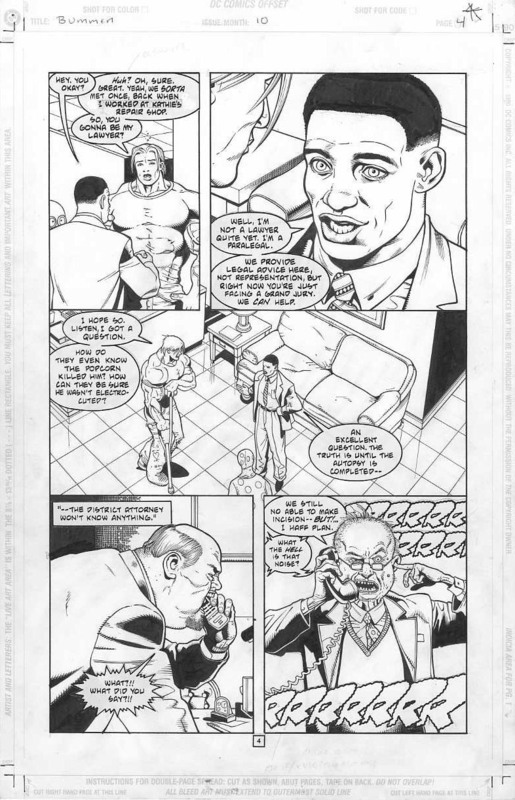 Blast From the Past: DC Comics' "Major Bummer"
My very first professional, fully-inked page (right before Christmas 1996). I had just turned 20 years old. Except for ruled lines with Pigma Micron pens, everything (even the tiny textures, faces, fingernails, etc.) was done with a Winsor Newton Series #7 size 0 brush at the time--simply because I thought "that's how you're supposed to do it." Good mindset for training, really. In panel 2, Lou's facial expression was swapped with one re-drawn by Doug Mahnke per the editor's request. 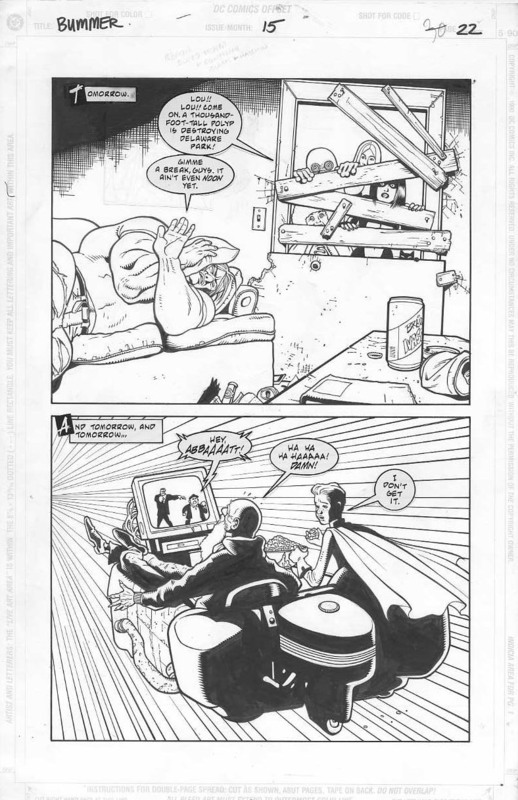 In the late 1990s, some of you may vaguely recall a series from DC Comics called Major Bummer, a hilarious and fun superhero (or super-slacker) book to this day. 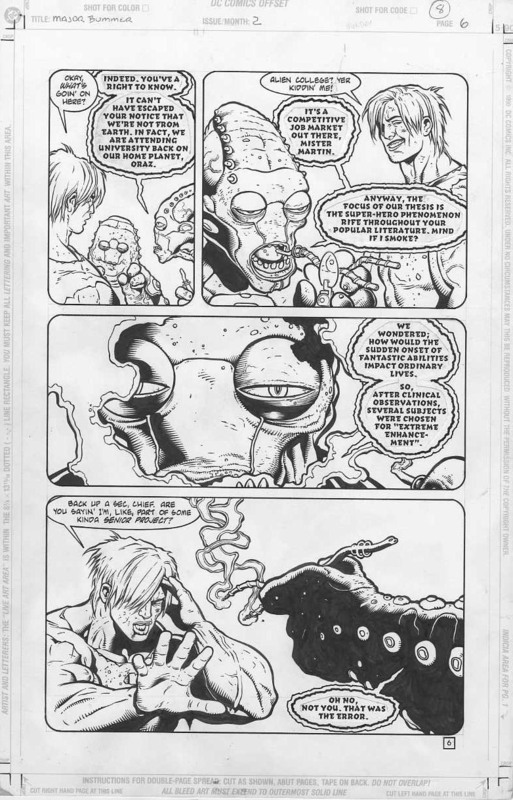 It was written by the great John Arcudi, pencilled by the great Doug Mahnke, and inked by the lowly me. It was also my very first pro work, hired by then-editor Peter Tomasi before he blew up as a writer. "Lou Martin has been granted incredible powers, and could become the world’s greatest superhero. Too bad all he wants to do is keep his superpowered self firmly planted on the couch. Like it or not, though, an absent-minded alien got Louis Martin, slacker extraordinaire, and Martin Louis, promising young lawyer and philanthropist, confused, and sent an Extreme Enhancement Module to the wrong guy, and now Lou's got superheroes trying to get him out of the house so he can... ugh... contribute to society, and an outlandish host of supervillains, monsters, and aliens all out to make a name for themselves by bringing him down!" When people ask me what my favorite comic I've ever worked on was, it was this one. Never before was there a time where I always looked forward to my next batch of pages to work on, simply because I wanted to see what hilarity John and Doug would come up with next in the storyline. Part of it perhaps was also due to my being so green in the industry, my "fanboyness" as of yet untainted by now 2 decades(!) of jade. We certainly went against the grain compared to the popular, action/drama-oriented superhero books of the time. But I guess people weren't ready for it, and after lackluster sales it was cancelled after 15 issues. Not even a nice push from Wizard magazine could help. For an original series to even last 15 issues in today's market is a miracle. But I am forever grateful to Doug, Pete, and John for taking a chance on this kid and jumpstarting my career in comics. I recently came across some old black and white scans of my work in during the run while cleaning out some old files. These are just what I was able to find. Funny looking back on this and seeing how rough my inks were. At the time I felt like I was growing at such a rapid pace with every issue. Also notice how there are editor Pete's notes done in blue pencil on some of the pages. 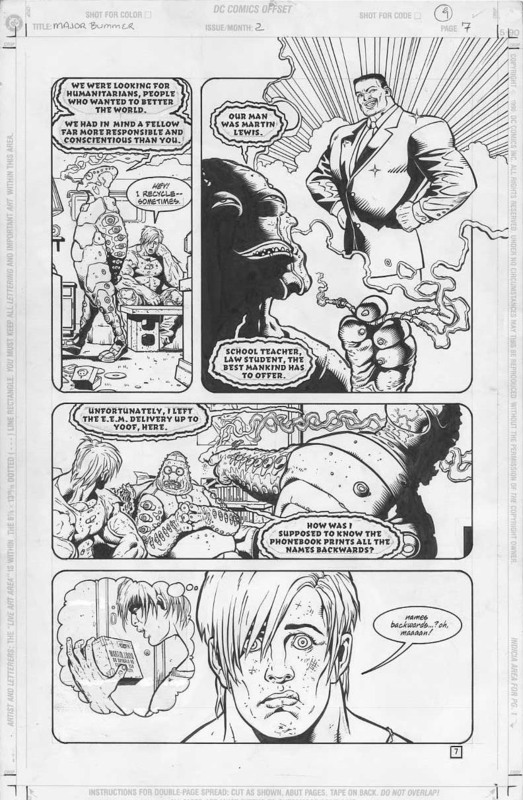 Finally, the biggest difference compared to today's art is the lettering done right on the page by Willie Schubert. Formerly hard to find as separate issues, Dark Horse Comics has collected the entire volume and you can order The Complete Major Bummer Super Slacktackular! on Amazon.